The Impala has been one of the most persistent nameplates in the Chevrolet brand since it was introduced back in 1958. Over the course of the past six decades, the Impala has been in and out of the bowtie brand’s lineup, but has been a consistent presence on dealer showroom floors since the year 2000. The reintroduction of the Chevy Impala back in 2000 lead to the future success of the mid-size sedan, which became the most affordable large car in the United States, according to U.S. News and World Report in 2014. The Impala was all-new that year, entering into its ninth generation, where it still resides. Before heading into your favorite Chevy dealer near Aurora, Chevrolet of Naperville, discover seven reasons why the 2017 Impala is a great car to buy new this year. The 2017 Chevy Impala truly is a mid-size car that has it all. Whether you are a single commuter, or a family of four – there is no better car to purchase for your situation than the 2017 Impala. There are so many good reasons why you should head out to Chevrolet of Naperville to buy one, but we managed to narrow it down to a list of seven solid arguments as to why the Impala should be the very next car you purchase. It’s Affordable: Featuring a starting MSRP of $27,300, the 2017 Chevy Impala is one mid-size car that is packing a ton of standard features that drivers want and need. U.S. News & World Report named the Impala the “Best Large Car for the Money,” which solidifies the fact that this sedan is a car worth every single penny. The base LS model includes intuitive features, such as Bluetooth phone integration, OnStar services, and a 4G LTE built-in Wi-Fi hotspot that is able to connect up to seven devices at one time. It’s Powerful: Just because you are considering a mid-size sedan purchase, doesn’t mean you should have to sacrifice power and performance along the way. While the Impala is a far cry from the performance-enhanced Corvette model, it still manages to deliver a respectable amount of power. The optional V6 engine delivers a whopping 305 horsepower rating, along with 264 lb.-ft. of torque. When properly equipped, the 2017 Impala can jog from zero to sixty miles per hour in just 6.4 seconds. Not bad for a family sedan, not bad at all. It’s Comfortable: There is nothing worse than buying a new car, only to realize after a few hours of driving, that it is uncomfortable. This happens more than you might think, but not with the 2017 Chevy Impala. The mid-size sedan from the bowtie brand is as relaxing to ride in, as it is powerful. The smooth-riding suspension delivers a comfortable, even ride for both front and rear seat passengers. Whether you plan to explore this great country of ours on long road trips, or simply need a comfortable ride into the office each day, the 2017 Impala delivers on all accounts. It’s Fuel Efficient: In today’s world, one of the most important aspects to consider when making a new car purchase is fuel economy. The 2017 Chevy Impala offers respectable fuel economy ratings, which are very much on-par with other vehicles in the same segment. The base 2017 model offers 22 miles per gallon in the city, along with an EPA-estimated 31 miles per gallon on the highway. For drivers wanting the more powerful V6 engine block, the Impala still manages to deliver 28 miles per gallon on the highway, which is great considering the pick-me-up that the more powerful engine has to offer. It’s Attractive: Regardless of whether you prefer sports cars or SUVs over sedans, it’s hard to ignore the aesthetic appeal of the latest Impala model. With its sporty, athletic stance, the 2017 Impala is as attractive as it is practical. Buyers who need a solid family car no longer have to sacrifice style in order to get it, thanks to Chevy’s latest version of this mid-size sedan. If you would rather not commute to work each day in a boring executive sedan, but prefer a sporty, muscular car – then be sure to check out the 2017 Impala in person. When you are cruising down the highway in your Chevy Impala, you will be the envy of every other boring sedan that surrounds you. It’s Connected: If there is one thing that Chevrolet excels at, it’s incorporating state-of-the-art technology into their vehicles. The 2017 Impala is no exception. The mid-size sedan features a long list of connectivity features and technology, and buyers in this segment are opting for the Chevy sedan over others in its class. With a generous and vivid color touchscreen display, drivers can connect their smartphone devices via Android Auto and Apple CarPlay to receive text messages, play music, and access their favorite apps. With a wireless hotspot on the go, passengers can connect up to seven devices at a single time. Regardless of where your next journey takes you, the 2017 Impala will keep you connected with the world around you, guaranteed. It’s Safe: Families and singletons alike will appreciate the lengths that Chevrolet has gone to in order to ensure the safety of occupants inside of the 2017 Impala. Boasting a perfect five-star safety rating, the Impala comes with an impressive list of standard safety equipment, as well as options that make it one of the safest cars in its class. From forward collision alert, blind zone alert, automatic braking, and rear cross traffic alert – the 2017 Impala is ready to keep you and your most precious cargo safe on the road. The 2017 Chevrolet Impala is now available at dealerships nationwide. 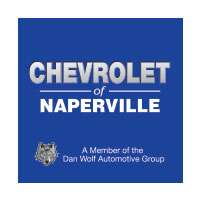 Be sure to stop by Chevrolet of Naperville to take this practical and attractive mid-size sedan for a test drive, today. It’s one thing to read about everything that this affordable car has to offer, and another to experience for yourself. If you are in the market for a new family sedan or commuter car, now is a great time to get behind the wheel of your brand new 2017 Chevrolet Impala.